Police make arrests in Ponovezh Yeshiva's study hall after internal violence spirals out of control. 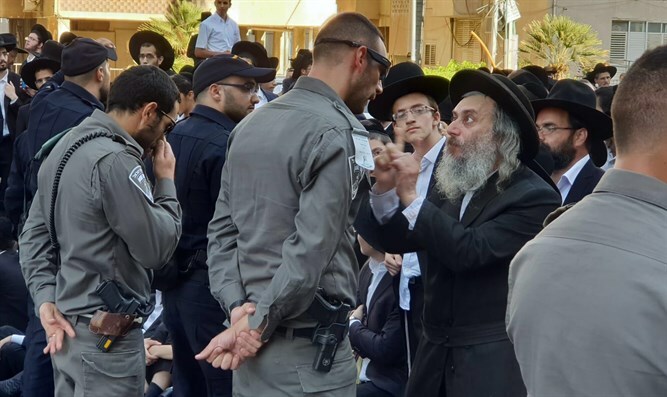 The violence at the elite haredi Ponovezh Yeshiva in Bnei Brak shows no signs of abating as police were forced to break up a brawl in the main study hall on Sunday. According to the Behadrei Haredim website, students sprayed each other with bleach, hurled yogurt, and deployed unused tear gas canisters they had collected from extremist haredi demonstrations. Videos circulating on the internet showed dozens of students punching each other and hitting each other over the head with broken chairs. Police arrested one student in a bid to stop the week-old violence. The fighting had started last Sunday and police have been summoned three times as the fisticuffs grow increasingly brutal. The quarrel was part of a longstanding dispute between the two factions over control of the yeshiva and the division of its territory. The supporters of Rabbi Shmuel Markovitz on the one hand, nicknamed the "haters," and Rabbi Eliezer Kahaneman's rival camp, called the "terrorists" have long been at loggerheads and tensions frequently lead to violence. Ponovezh is one of the top institutions in the haredi world, and the ongoing internal strife has been a black eye for the community. Ponovezh head Rabbi Berel Povarsky pleaded for calm after the violence broke out last week and said that the students should concentrate on studying Torah. "The evil inclination wants to interrupt our learning of Torah during the month of Elul in the most important yeshiva in the world, our yeshiva," he said.